Okay so along with my engine swap, I also upgraded my front brakes. Edit: You will not be able to use anything smaller than a 15" rim if you do this!! Still gotta check to see if the 15" steel rim will clear. I am thinking it should. I first saw this done in Enviri's thread. I figured I would make an official post about this so newcomers can see a quick good options for upgrades, for cheap. Our cars don't need a ton of braking power, but a little more will never hurt. Big brake kits are $$$$ and can be counterproductive for our cars. We really don't want a lot more rotational weight. It can be tough to fit wheels. Cost. Using the Yaris SE front rotors and calipers from a xD/Corolla are perfect upgrade. It takes us from 255mm to 275mm. A bit more surface area to grab, and slightly bigger rotor and caliper also really fills out the wheel nicely. So if you shop right you can probably do this for around $500. I waited until I really needed brake to help justify the costs, since I was gonna buy pads and rotors anyways. That is it as far as base needs. Stainless steel braided lines. I bought mine from Microimage. A good idea if your vehicle has a lot of miles. I live in PA so the winters are rough here to. Replacing the old rubber lines is never a bad idea. Fronts for about $60. Full set for about $120. I did the rears at the same times since I was already making a mess. The other thing I would recommend would be some good caliper paint. I used G2 system, from Tirerack. It is a two part epoxy paint, and it is fantastic. Much easier to do now, before everything is installed. About $40 shipped. Worth the looks and protection, IMHO. Please excuse my messiness. I also coated the rotor hats, and edges. So here comes the best part. These bolt right on. Just take off your old calipers, pads, rotors and put these on. Whether you just replace front calipers, or do braided lines the whole way around, you will need to bleed the brakes. If you did lines the whole way around start with the passenger rear, then the drivers rear, passenger front, and finally the drivers front. I went around again just for good measure. You will need another person to help with this. You will have the person in the car pump the brake pedal up and hold it while you crack open the bleeder. Once fluid slows down coming out, then you close the bleeder. Repeat this until the fluid comes out without bubbles, before moving onto the next bleeder. My bleeders were 8mm. I recommend a wrench here for ease of quick opening and closing. Last edited by brushforhire; 05-24-2016 at 11:32 AM. Great that you shared this. I am thinking this will be a worthy upgrade with the new speeds I should be hitting. It will be critical with the shorter shutdowns at the Texas/Arkansas/Colorado Mile venues, etc. Very useful info! I shall invest in this once my turbo install is complete. Great info and a nice upgrade. 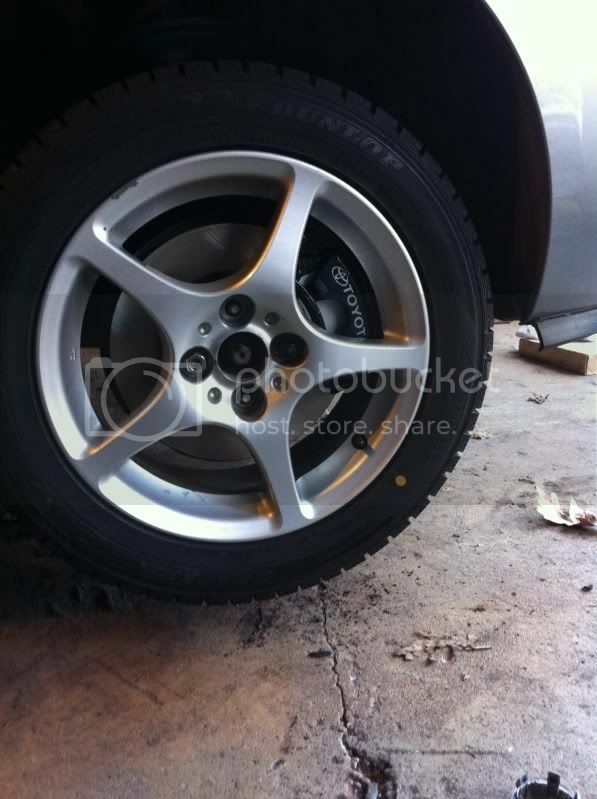 From the picture comparison this upgrade for the yaris seems like it's the stock brakes on my JDM 2007 Vitz RS. I could be wrong thou. It is possible that it is the same, since it does use the Yaris SE front rotors. I would imagine that the Vitz RS probably uses the same rotors. I would be curious about your brake pad size. The Vitz RS pad is about 4-5 mm taller than the yaris pads. Here are dimensions for the Yaris hawk pads. Last edited by brushforhire; 05-22-2016 at 03:21 PM. Quick Q: are 15" the smallest diameter rim you can fit with this brake upgrade? Or will 14" still fit? If 14s just fit over the stock brakes, then 15s are probably the smallest that'll fit over the bigger brakes. 15" will be the smallest you'll fit over the bigger brakes. just a FYI: tire rack currently (as of oct 5 2016) has a special on hawk performance pads for this BBK for $40 off regular price. Don't want to revivie an old thread, but figured I'd rather keep the facts for this on this thread. What year Yaris SE are the oem rotors from? I'm due for new rotors and pads next summer and figured if I can get everything off of rock auto it'd be worth it and cheaper than what the OP quoted. Hello Yaris enthusiasts, anyone happen to know if the Yaris SE rotors (275mm) come slotted and drilled? I cannot seem to find them using the Yaris SE pn: 43512-52130.
all yaris SE is 275 front. MUST BE FROM SE model only. 43512-52130 is not drilled or slotted. "Using the Yaris SE front rotors and calipers from a xD/Corolla are perfect upgrade." What years for the Yaris SE? And what years for the Xd and Carolla?